Grilled vegetables provide a punch of flavor on the plate! Eat them on their own or within a recipe. Grilling times vary for many reasons including grill heat, thickness and overall size of food pieces, where a food is placed on the grill, and personal taste. So the times given below are simply a guide and reflect a medium to medium-high pre-heated grill. The best ways to tell when veggies are done grilling is when they have grill marks and a knife or fork can be pierced through them easily. Because veggies cook fast, it’s important to keep an eye on the grill. If you are placing food directly on the grates, make sure the grill is clean and oiled. Brush veggies lightly with oil or marinade to prevent sticking. For a quick marinade try low-fat salad dressing. Add a spice or combination of spices if you like. The download in the toolbox on this page has information on what spices go well with different veggies. Thread asparagus through one or two skewers. Skewer them in a row like a fence, one skewer toward the top and one toward the bottom. (If asparagus break when putting on skewers, you can microwave for 1-2 minutes to soften them, so the skewers go through easily.) Turn once while grilling. Cut in half crosswise (horizontally) in the middle. Remove stem and seeds. Then cut each half into 4 even sized pieces. Grill on skewers or directly on the grill grate. In husks: Soak covered in water 15 to 30 minutes. Then grill, turning every so often. When cooked remove husks and silks and season if desired. 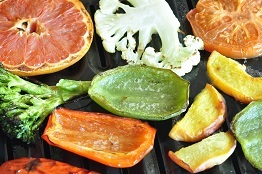 Without husks: Remove husks and silks and arrange on the grill parallel to the grates. Turn occasionally. Trim beans and wrap in a double layer of heavy foil. Seal the edges of the foil tightly to make a packet. Trim the tops. Turn several times while grilling. Remove the outer leafy leaves and save for salad or another use. Cut the head of romaine in half lengthwise. Thread mushrooms on skewers through the stem and cap. Turn often while grilling. Cook gill side up, then flip and cook a bit on the other side. Peel onion and trim both ends. Cut the onion crosswise (horizontally) into ½ inch slices. Directly on the grill: Use skewers as needed to hold the onion together. Depending on the width between grill grates you may be able to put them directly on the grill without skewers. In a foil packet: Wrap slices in a double layer of heavy foil. Seal the edges of the foil tightly to make a packet. Turn often. Cut in half, or into ½ inch slices. Wrap in a double layer of heavy foil. Seal the edges of the foil tightly to make a packet. Cut lengthwise (vertically) into ½ inch slices. If the squash is really long cut in half down the middle before cutting lengthwise. Press tofu for at least an hour before grilling to release water: lay tofu on a couple of towels in a bowl, layer a towel on top. Place a bowl or other weight on top. Refrigerate while pressing. Once pressed, cut into ¾ inch squares and skewer. Thread tomatoes onto skewers. Turn several times while grilling. Cut into half. If you will grill both sides take out the watery pulp and seeds before grilling.